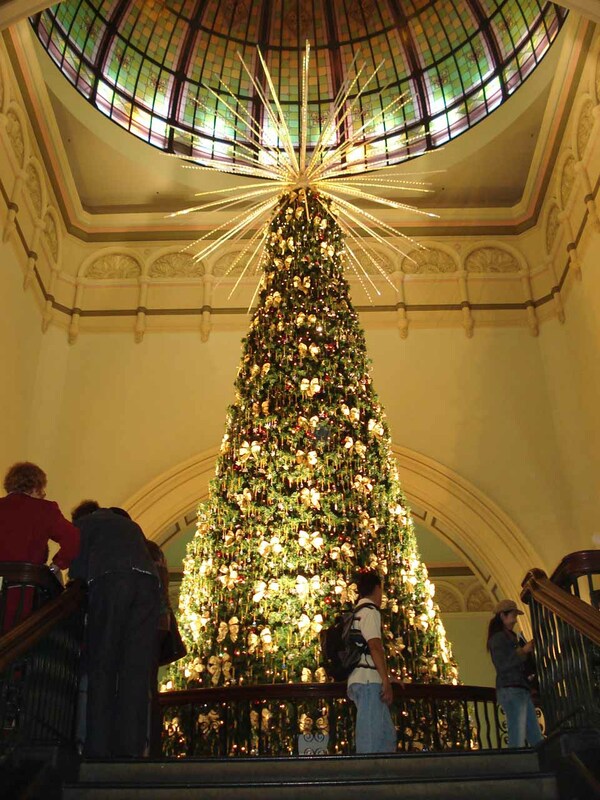 We took a red-eye Qantas flight from LAX direct to Sydney, and it wasn’t until about 8am when we finally made it to the Sydney Airport. We had a lost a day on the flight over here since we crossed over the international date line. 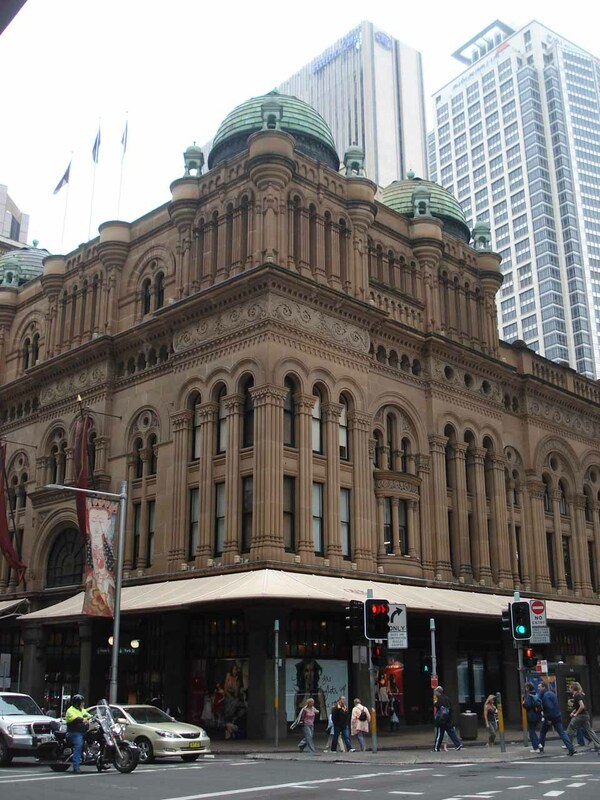 After the usual drill of picking up our checked baggage (where lost luggage was always a concern), we eventually got through customs, picked up our rental car from Hertz, and then proceeded to drive to the Sydney CBD eventually arriving at the Park Regis Hotel at 10:30am. Fortunately for us, they let us check in early. 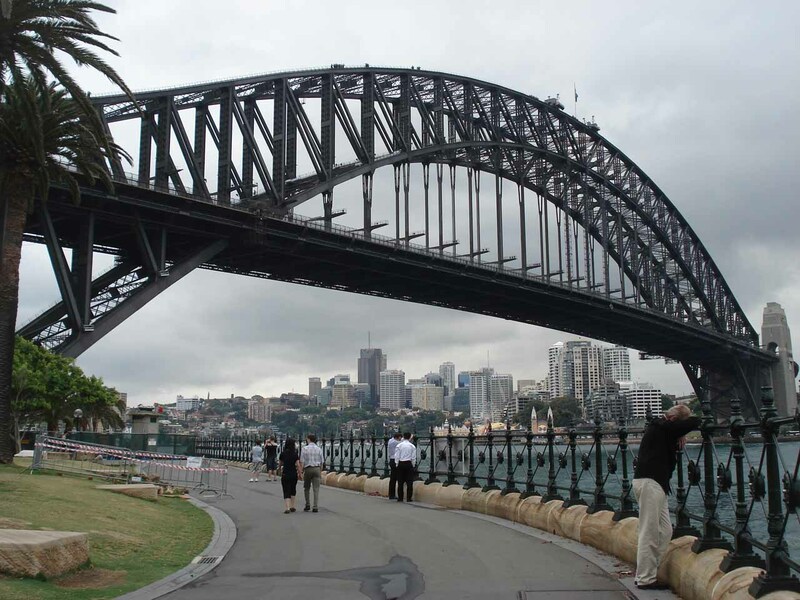 Julie and I were a little fatigued, but we slept relatively well on our red-eye flight over here so we had some energy to get settled, then walk to the Sydney Harbour. 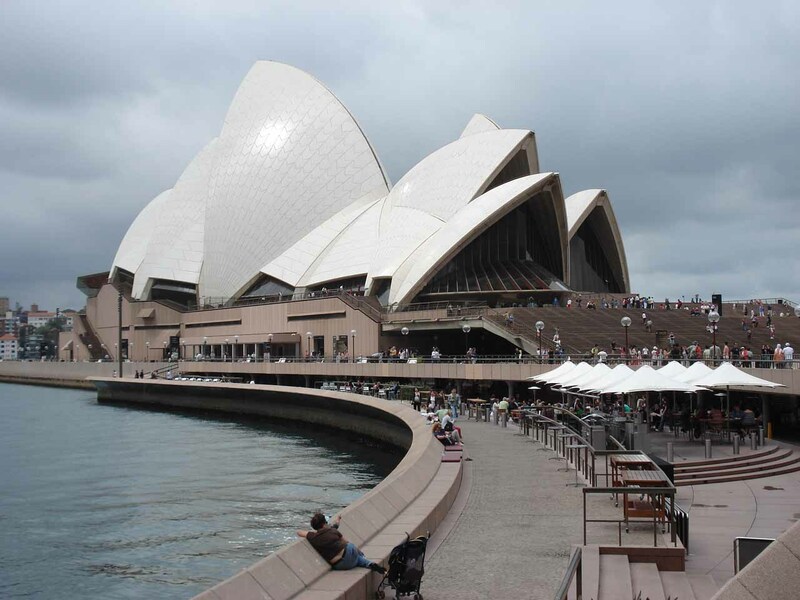 We had always wanted to see the Sydney Opera House, and now we were about to get that chance. 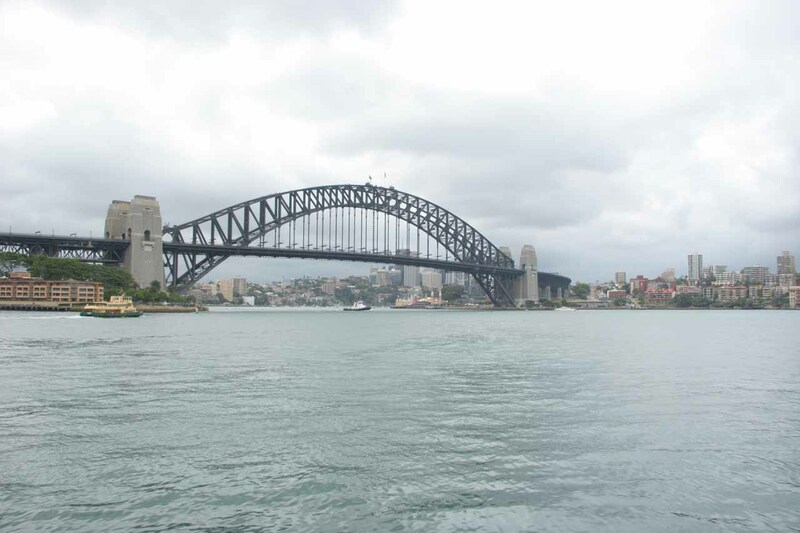 It wasn’t until around 12pm when we finally arrived at Sydney Harbour. 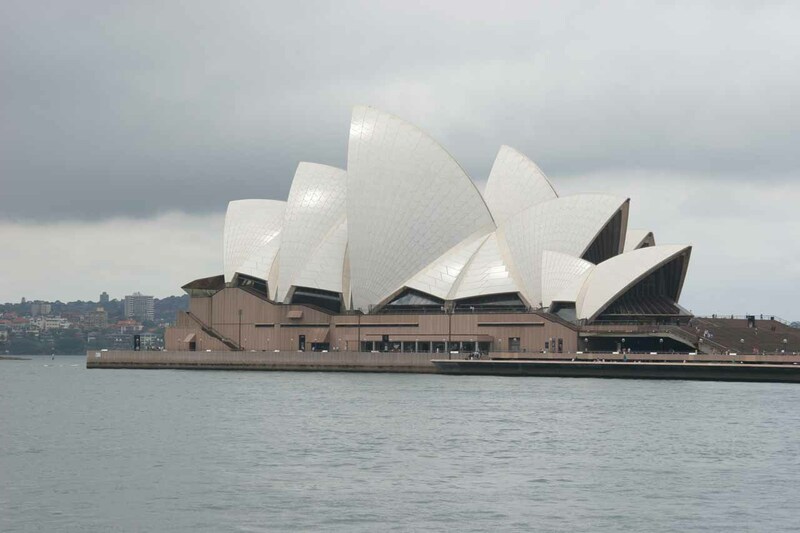 The skies were a bit overcast and threatening rain so the white exterior of the Opera House kind of blended in with the greyish skies. 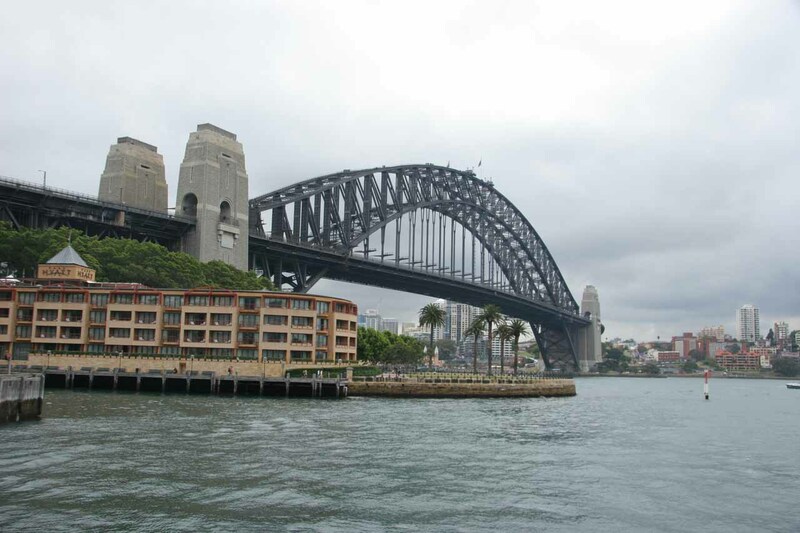 Over on the other side of the harbour, we saw Sydney Harbour Bridge, which was the famous arched bridge that we noticed on travel shows where it was possible to go on an adrenaline rush tour allowing you to climb on the bridge. We didn’t do that (nor did we feel in the mood to do it given the threatening weather). 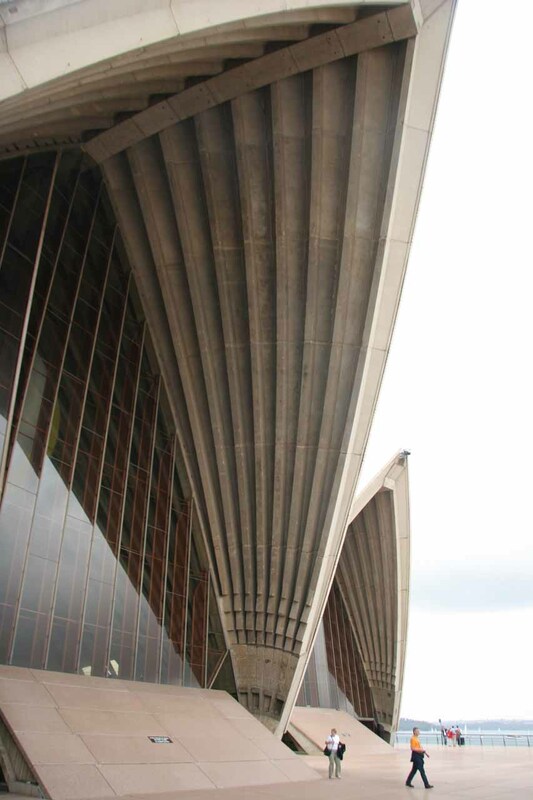 So we spent the better part of the afternoon (or arvo) walking closer to the Opera House and just taking photos of the iconic building with the bridge more face on from across the harbour. We had a little bit of a takeaway lunch while enjoying the scenery here. But beyond that, we really didn’t do much more. 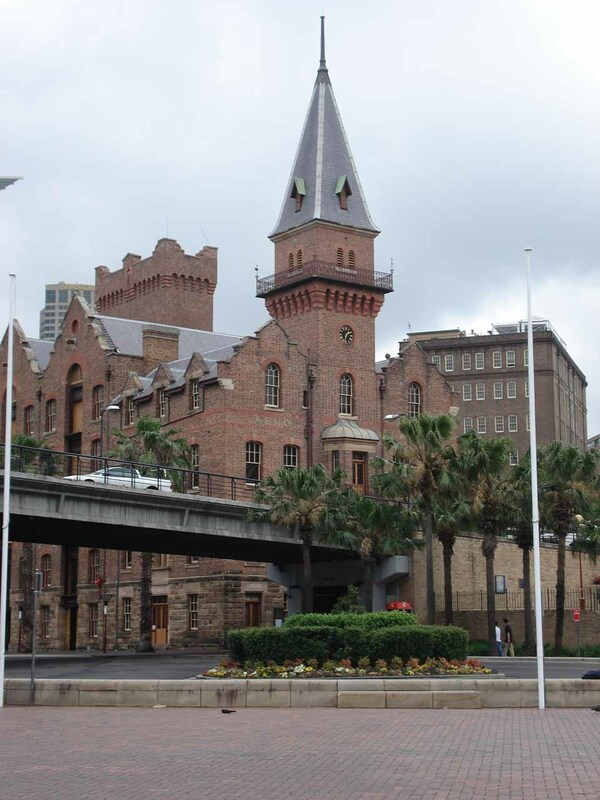 We then walked around the area (called the Rocks, I believe) just to get the flavor of this place. We indulged in some post-lunch ice cream, then just strolled around a bit more, before we finally called it a day and returned to our accommodation as fatigue was setting in even more. When evening came around, we merely just went downstairs for a kebab at a hole-in-the-wall joint around the corner. I guess jetlag was well underway so we just kept it simple on this night. 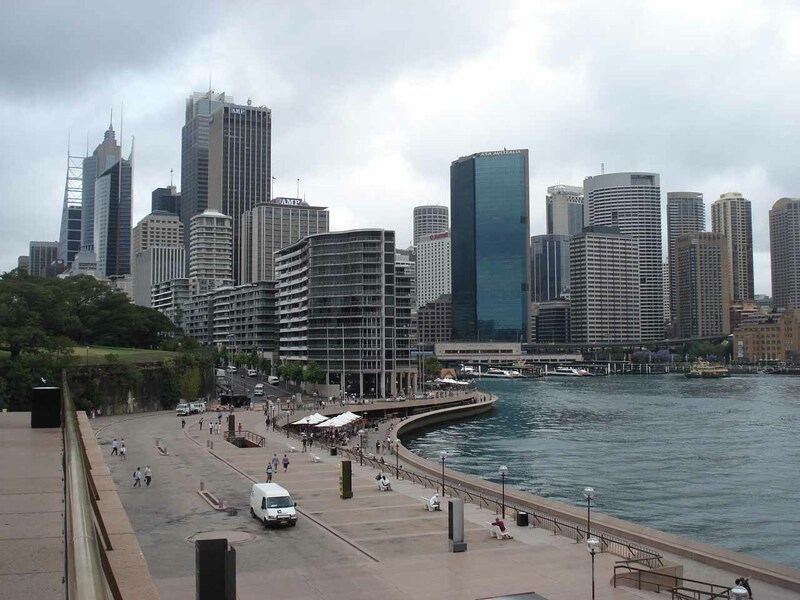 After spending a couple of days in Sydney to get accustomed to the local time zone, we had no trouble checking out of the Leisure Inn Park Regis in Sydney’s CBD at 6am and motoring our way out of the city and into the Blue Mountains. 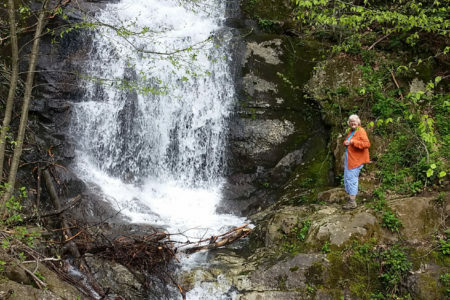 In my mind, it was the first day of nature touring and given the rain of the last couple of days, I was anxious to see if there would be waterfalls flowing up in the mountains. And so there we were – back out on the highway driving on the left side of the road. 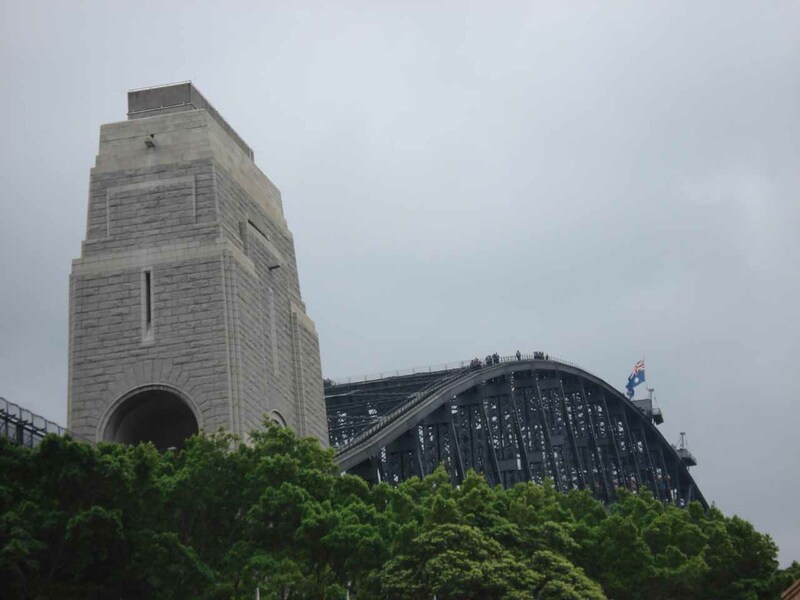 It didn’t take long before we had to dump some coins at a toll station (very reminiscent of Norway) as we had left Sydney. I sure hoped there weren’t many of these. I didn’t recall seeing any of these in our last trip to Oz six months ago. They didn’t take credit cards either so that was a bit of a nuissance. 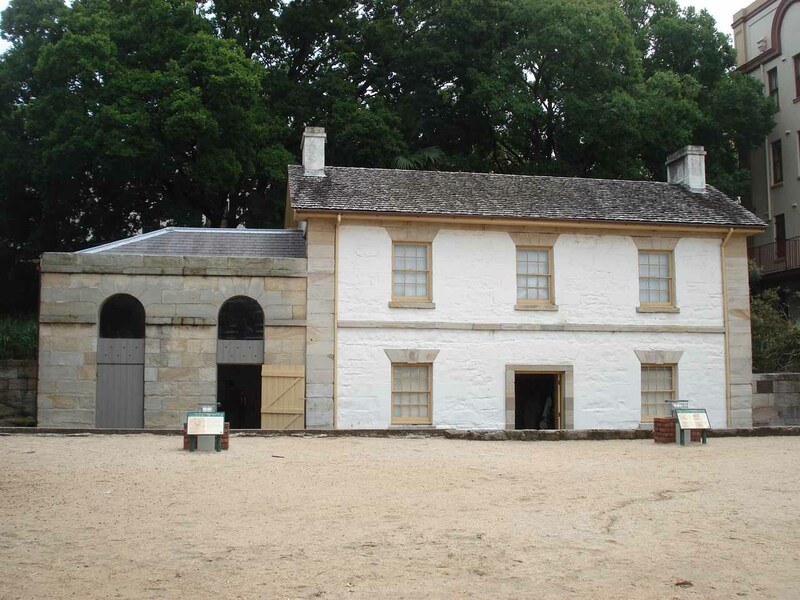 The plan for today was to head for the Kanangra Walls, which were well past the Jenolan Caves, which in turn was well past our accommodation at the Katoomba Town Centre Motel in Katoomba. 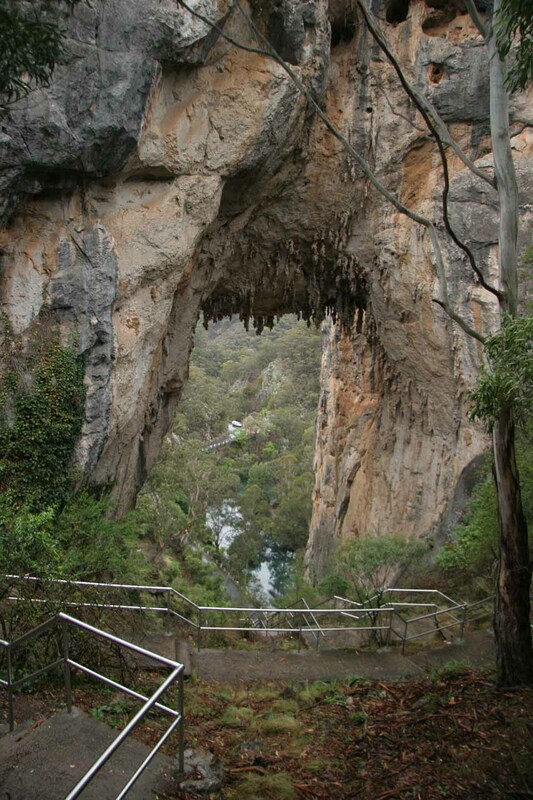 We were on the hunt for Kanangra and Kalang Falls as well as some arches near the Jenolan Caves. 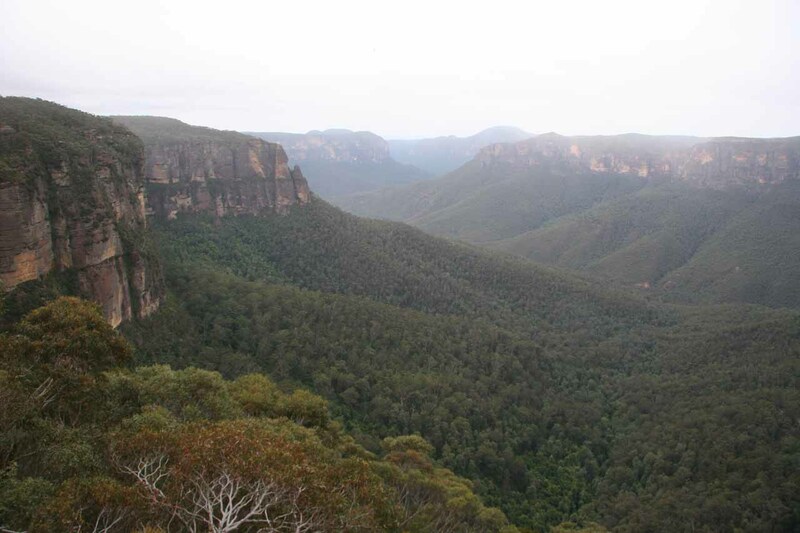 Then, we would spend the remaining hours of the day looking for more waterfalls and views in the Blue Mountains itself. By 7:46am, we had made it to the Katoomba Town Center. It was already biting cold and the rain and wind made it very undesirable to be outside the warmth of the car. It was still too early to check in to our the Katoomba Town Centre Motel, but we did pick up some meat pies for breakfast (or brekkie as the locals would say). By 8:15am, we continued to head further west. 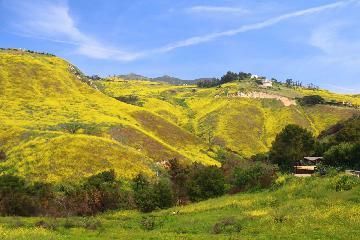 It took over another hour or so of driving on a combination of well-paved (albeit hilly and curvy) mountain roads. The whole time I was worried about cops and kangaroos so I was passed on numerous occassions by other motorists. 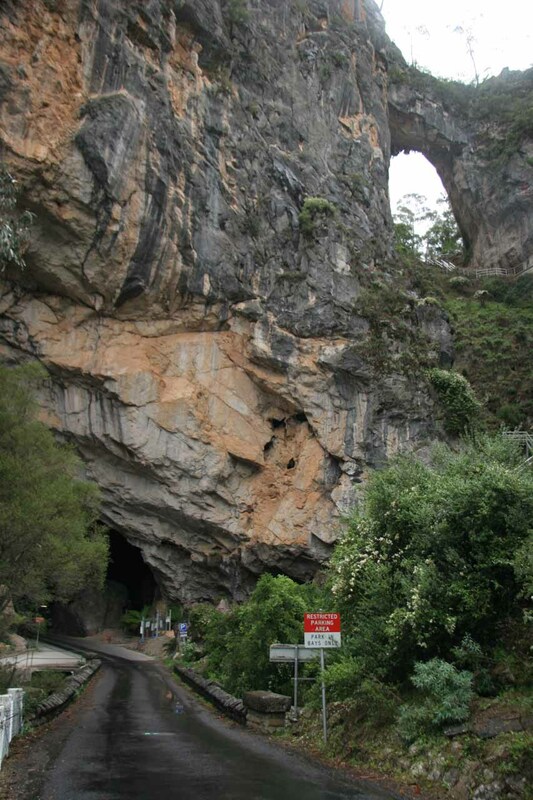 But eventually at 9:25am, we drove our right through an impressive arch called the Grand Arch before getting to the parking lot for the Jenolan Caves. We had spent some time walking around the facility and checking out the maps. After seeing what tours were available and when they took off, we opted not to do them. 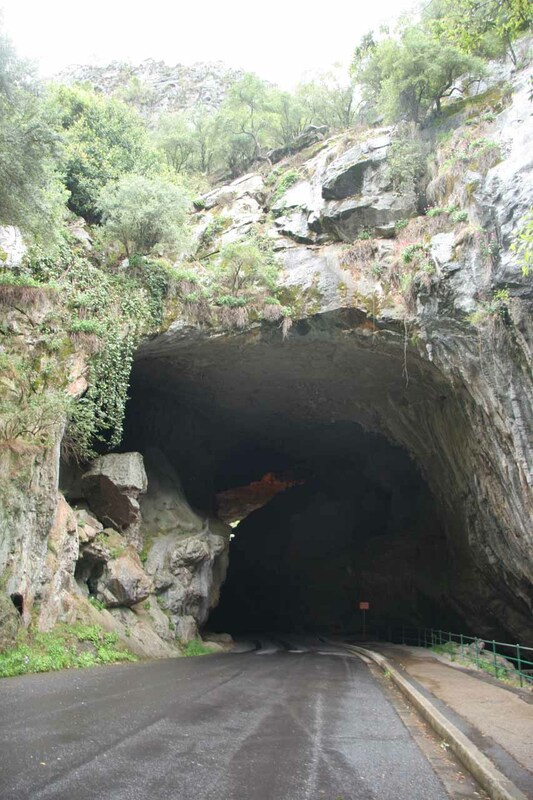 Besides, we had already seen numerous caves in the past so we weren’t regretting this decision. Instead, we decided to walk to the Carlotta Arch from the back at 10:25am. The stairs going up to the arch from the front leading away from the front of the Grand Arch was closed probably due to cliff instability. So we took the longer back approach instead. And so we wasted no time in getting up to the arch and back. We couldn’t actually get good views of the arch because they closed the trail leading closer to the arch’s opening from its back as well. So I went past the barricade and took whatever photos I could before getting back up to safety. By 10:41am, we were back at the car. 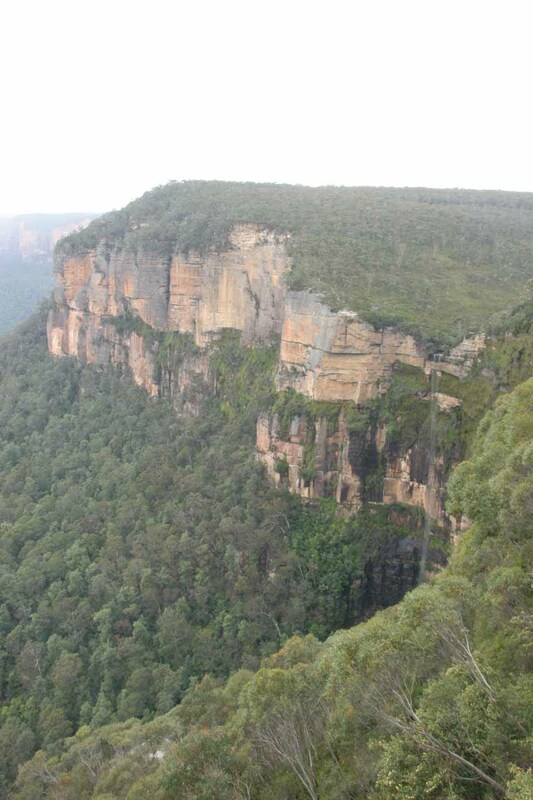 Next, we proceeded to continue driving towards the Kanangra Walls. 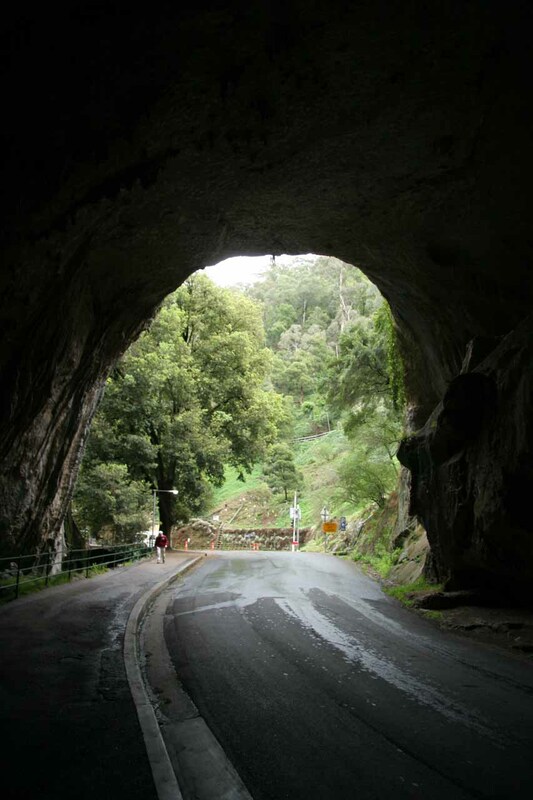 The road had been paved but single-lane and winding in many spots around the Jenolan Caves area. 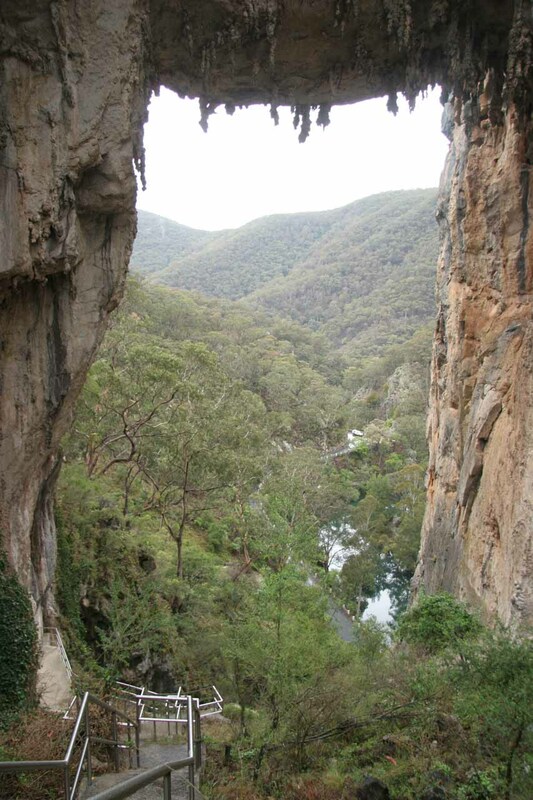 Once we climbed out of the canyon, we took the spur road leading to Kanangra Walls, which was unsealed. The unsealed road was pretty wide and not too rough. Julie scared me when she saw a kangaroo hopping before us and gasped. Not wanting a repeat experience from the last trip, I was especially keen of these guys jumping in front of us even in broad daylight! Finally at 11:23am, we arrived at the Kanangra Walls car park. There were quite a few other cars here, but I honestly couldn’t tell where these people went. It sort of seemed like we had this area to ourselves. So off we went on the trail in search of the waterfall here. 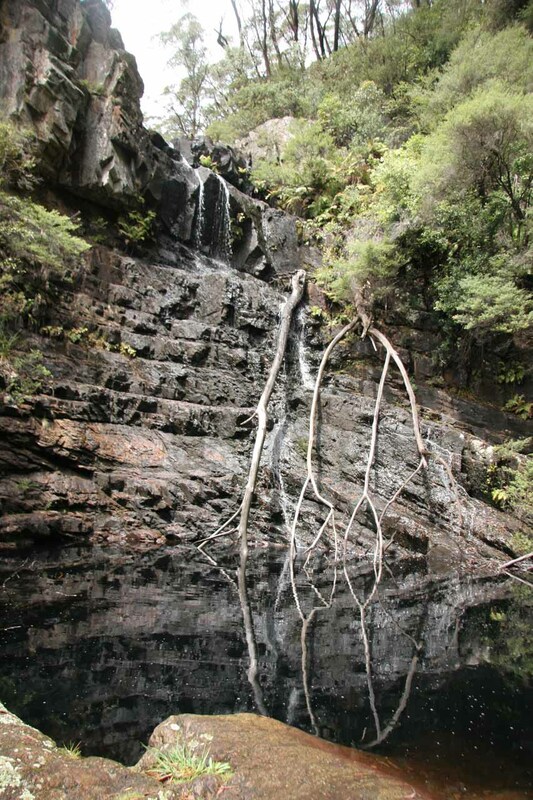 We were on the hunt for both Kalang and Kanangra Falls. 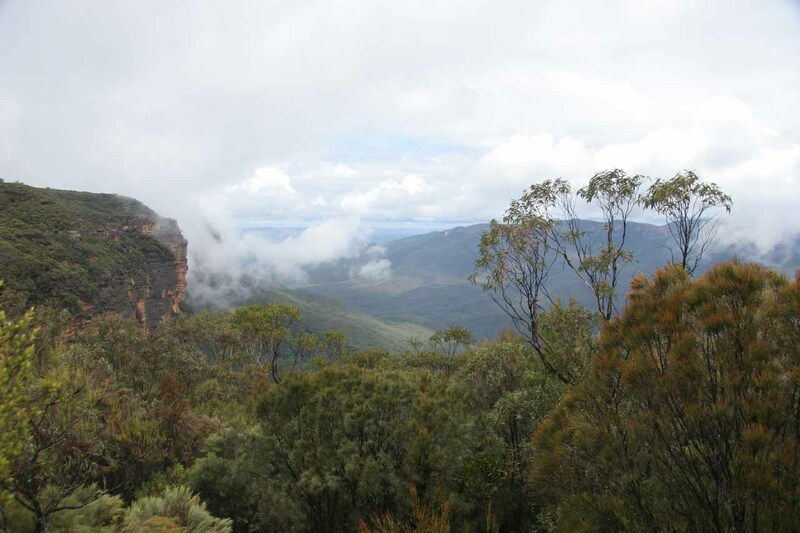 After a few minutes, we skipped a trail junction with the Plateau Walk and continued onto an overlook where we could see the Kanangra Walls. 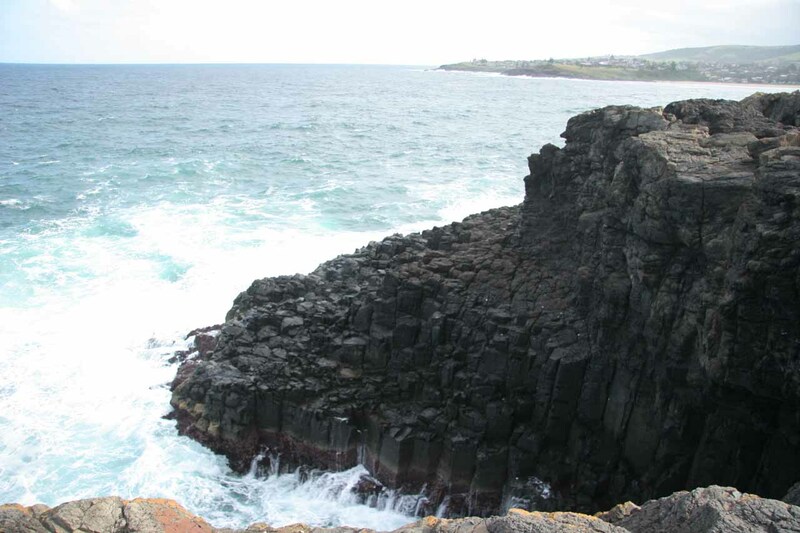 The walls were basically a long section of exposed cliff averaging about 130m (roughly 400ft) in height. 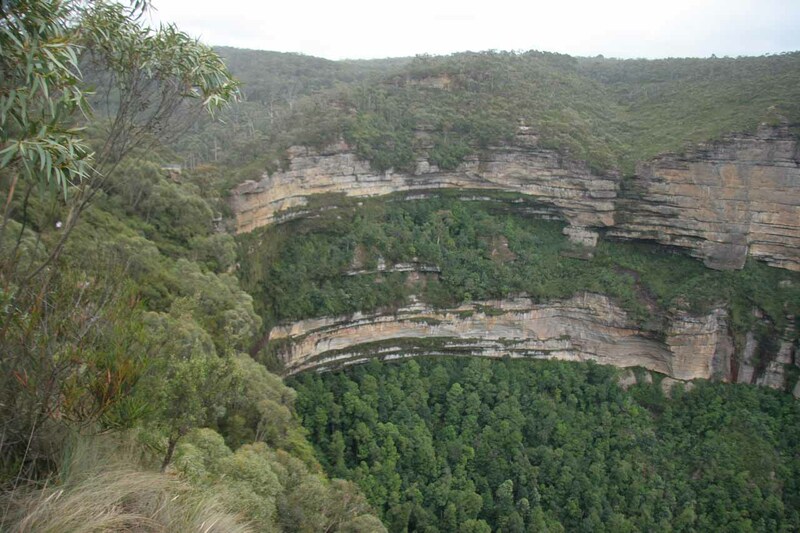 It was quite an impressive sight and it was also possible to see other features in the distance including Lake Burragorang – Sydney’s water supply. As we continued our walk, we were quickly confronted with some signs indicating the 1-hour return Waterfall Walk. 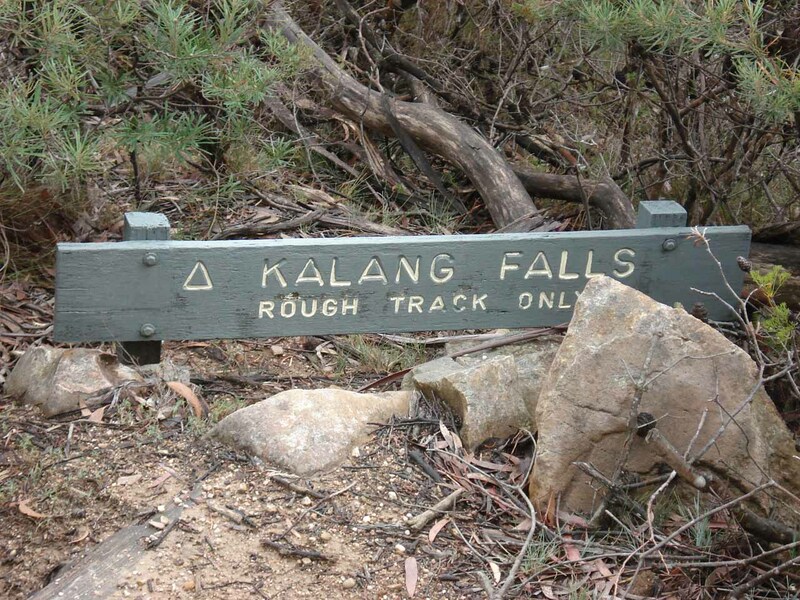 Apparently it headed to Kalang Falls, but I was a bit puzzled as to where Kanangra Falls was. 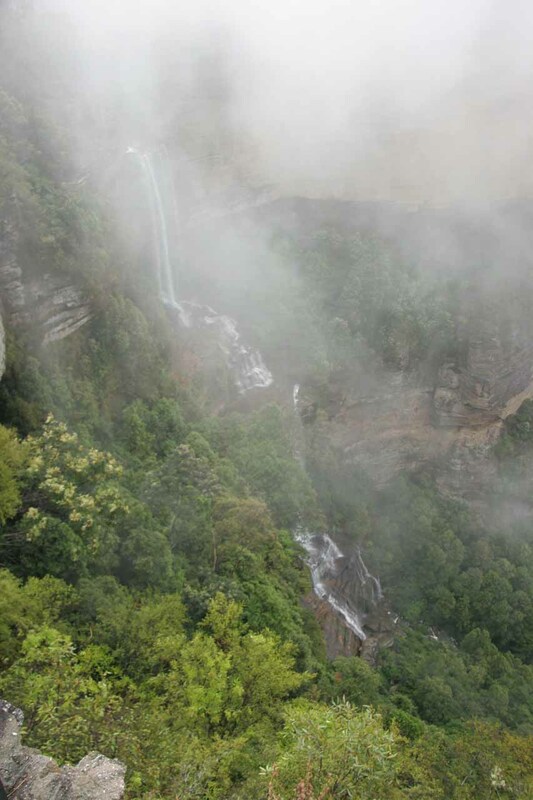 I figured we could see Kalang Falls first before looking for Kanangra Falls and so that we did. We headed down the steps with some slippery parts. 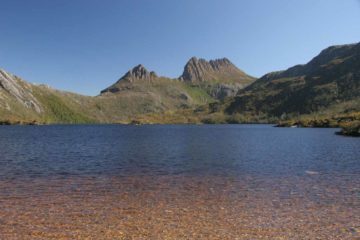 Eventually, we made it down to the Kanangra Brook where some precarious (i.e. 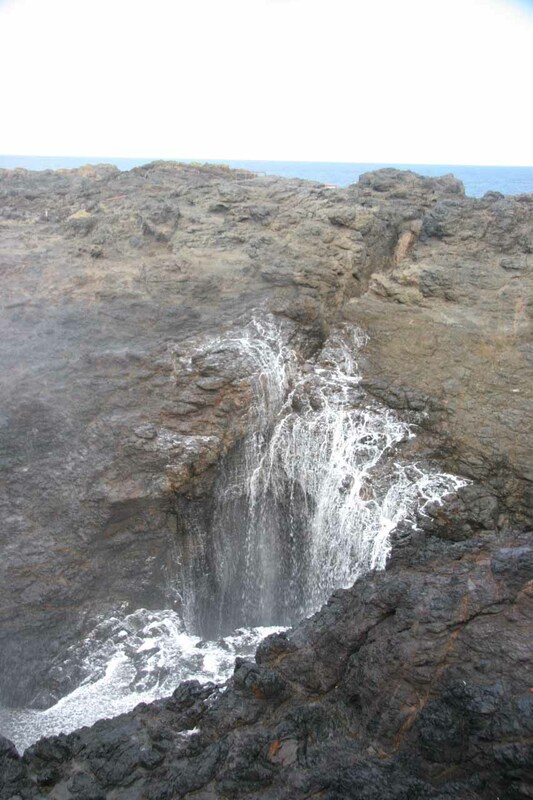 slippery) scrambling took us right to the plunge pool of the falls. Unfortunately, the falls were not flowing particularly well. Apparently, the rains of the last few days either didn’t touch this area or it simply wasn’t enough to rescue this waterfall. 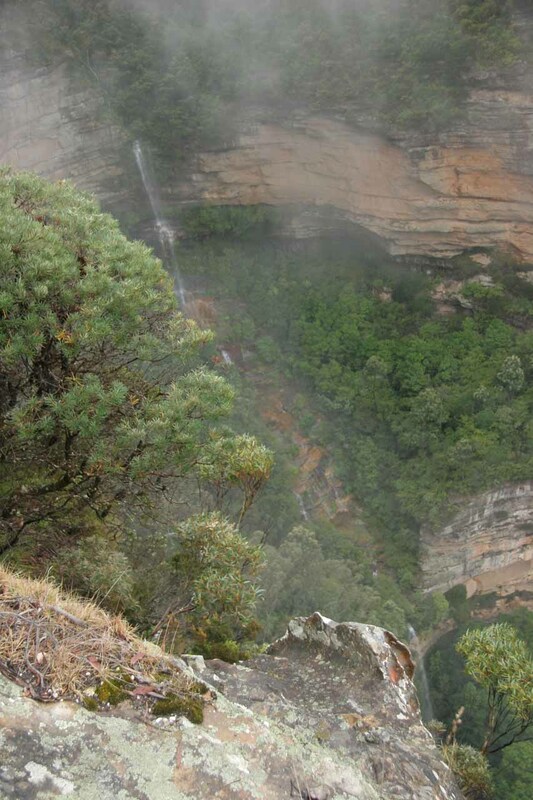 It began to make me wonder whether this was why Kanangra Falls couldn’t be seen. It also made me wonder whether the rest of our waterfall-viewing experience would be as disappointing as this considering the drought they’re in. 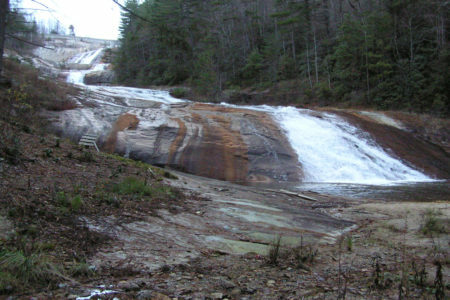 So after spending some time looking at these disappointing falls, we headed back up. Julie continued to the car while I went looking for the so-called Turat Lookout. After a few minutes of futile searching and tolerating the noise pollution of dirt bikers who used the trail as their road, I rejoined Julie in the car. By then, it was 12:52pm. 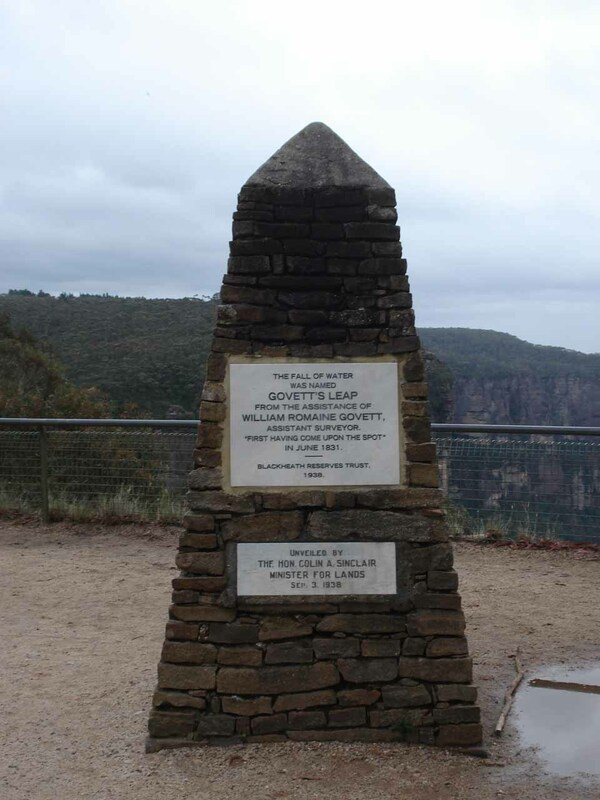 By 2:49pm, we finally arrived at the Govett’s Leap car park. Since Julie told me that we should check in to the Katoomba Motel before 4pm, it didn’t leave us very much time to enjoy this little spot. There was an expansive overlook adjacent to the car park. 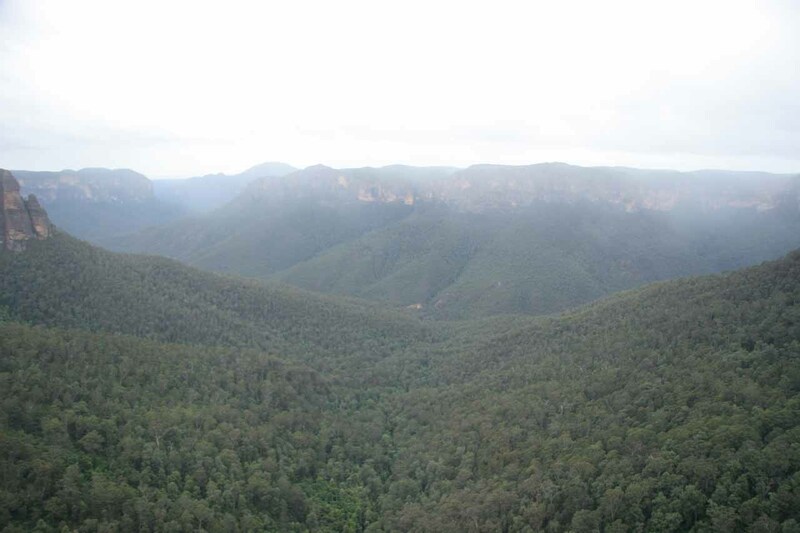 From here, we could see deep forested valleys below us with some exposed cliffs towering over the scene. 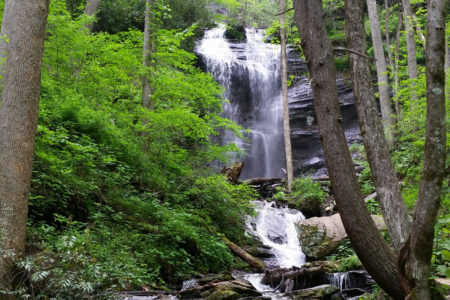 Off to the far right was a light but free-falling waterfall known as Bridal Veil Falls. The falls was certainly what I expected from our preliminary trip reports. 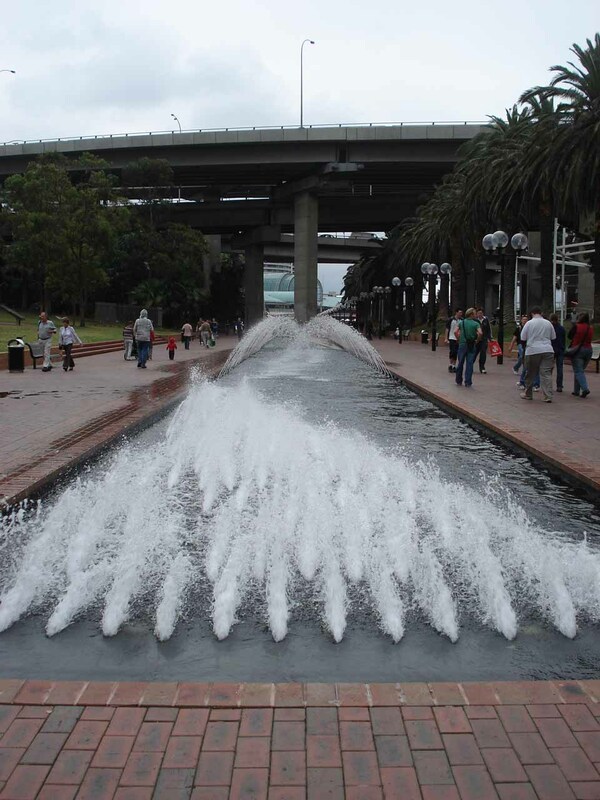 Sometimes I wondered whether it always flows this way or if it has a very short season and shouldn’t really count as a legitimate waterfall. There were walking tracks that were supposed to take you closer so we decided to spend a few minutes to check them out. The first track we took promised to get us a better look at Bridal Veil Falls, but it didn’t really deliver. There was too much foliage obstructing the view. When we went the other way towards Horseshoe Falls, we couldn’t see it. When we saw a pair of female hikers down below at an overlook, Julie yelled to them and asked how the waterfall was like. That was pretty much what we wanted to know. No falls, then no further exertion on our part – especially since Julie had already indicated we had to get back to Katoomba before 4pm. We returned to the car at 3:37pm and finally checked into the Katoomba Town Centre Motel at 3:56pm. After dropping off our baggage, we traveled light again. But the weather quickly deteriorated into overwhelming fog and rain. 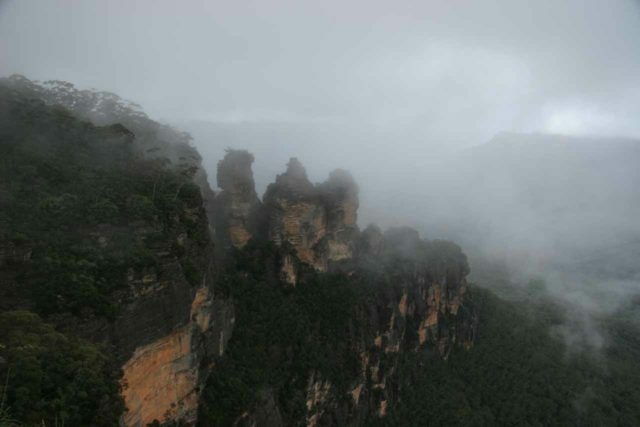 At 4:15pm, we decided to first check out Echo Point, where we might finally see the Three Sisters. But as we had feared, we couldn’t see a thing and the rain was miserable. We also couldn’t find legal parking so we just parked on the street with no intention to pay at the self-help kiosk. We sought shelter in the visitor center looking for maps and literature that might help us on this trip or for our trip logging. But other than that, we didn’t get much out of this visit. 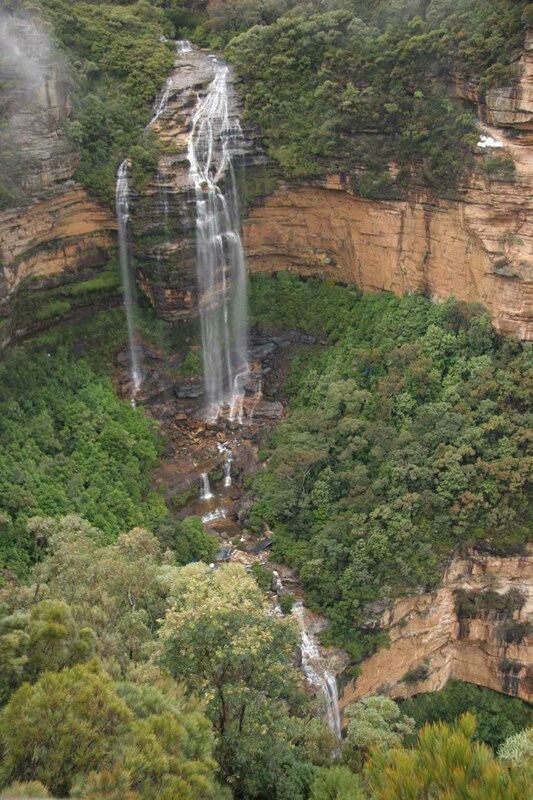 So ten minutes later, we got back in the car and arrived at the Katoomba Falls kiosk just after 4:30pm. But again, it was very rainy and foggy. So we gave up on any additional walking and waterfall viewing. The kiosk was also closed so it wasn’t like we could chill out inside and try to wait for an opportunity to see the falls if the weather would improve. Not knowing what to do, we returned to Echo Point and back to their visitor center. We ended up buying some Blue Mountains maps but really didn’t do much else. We did momentarily see the Three Sisters from inside the visitor center, but we decided to try again tomorrow. At 6:30pm, we were left with the task of trying to figure out where to eat. After seeing this expensive but tasty-looking cash only place called Paragon Cafe (which indicated they were open but their doors were locked), we ended up eating at Cafe Zuppa in the town center. It had been six months since we had sticky date pudding and of course we had to have that for dessert. So with the weather not cooperating this afternoon, we had a lot to do tomorrow. Hopefully the weather will let up somewhat. And with that we went to sleep. Julie and I awoke at around 7am. When we looked out the window, we saw mist and rain still falling. It certainly wasn’t what we were hoping for especially considering we were going to be staying in Wollongong tonight. Well at least breakfast was included on our night’s stay in the Katoomba Town Centre Motel so we mind as well take advantage of that. Perhaps the weather might start improving later in the morning, I hoped. After having a very satisfying buffet breakfast, it was about 8:38am when we left. 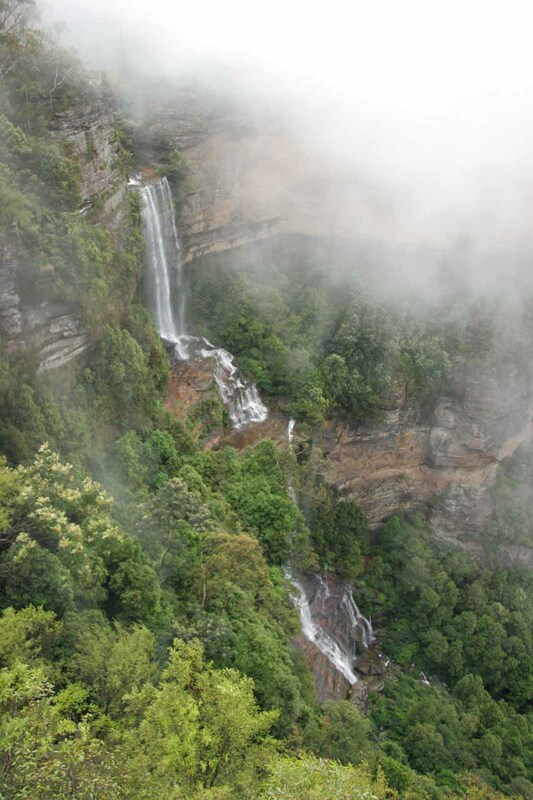 Since Katoomba was a lost cause this morning, perhaps we could head back over to the Govett’s Leap vicinity and try to get an alternate view of Horseshoe Falls considering the relentless rain we were getting last night. And sure enough, when we got to Blackheath, there was already a hint of sun and no fog, which we couldn’t say for the Katoomba vicinity. And so we continued driving in search of the Pulpit Rock lookout, but the unsealed road freaked Julie out and so we spent time wondering whether we had gone the wrong way or not. 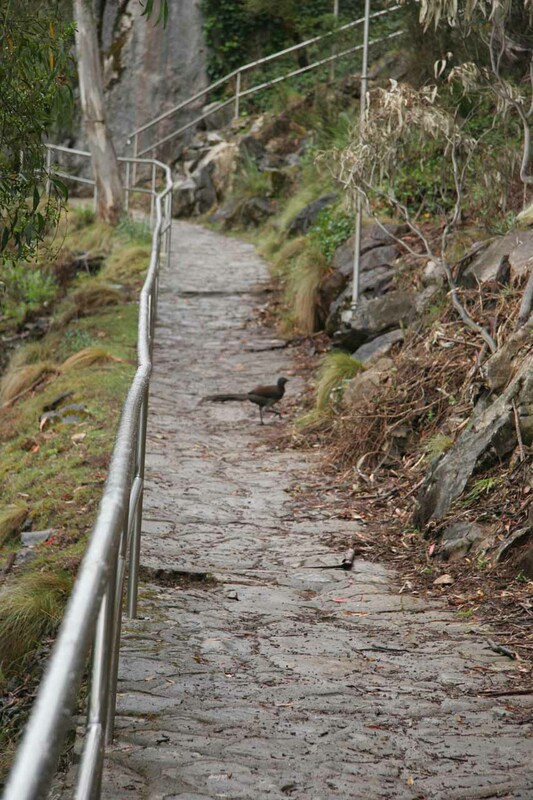 Eventually it was just after 10am and we decided to just forget it and return to Katoomba. 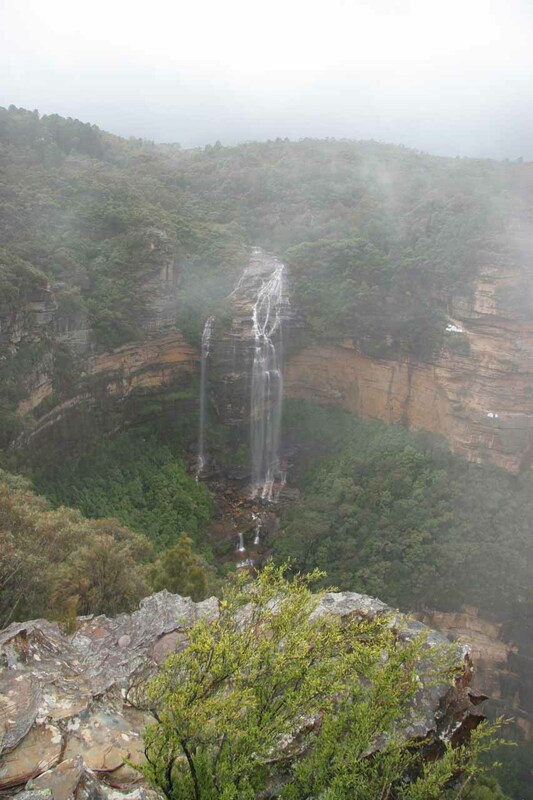 By 11:18am, we were back at the Katoomba Falls kiosk and proceeded to walk towards the falls viewpoint. As expected, the view was of nothing but fog. Mother Nature seemed like she was teasing us as we could hear the falls from the viewpoint. How frustrating! We were joined by another Australian family from Melbourne who were also looking for the same thing. They told us that yesterday was better at around midday and that it was a shame we couldn’t see it now. Julie and I took this opportunity to talk to them about Australia and the current drought. Upon learning about our hunt for waterfalls, they did say the Grampians would be dry but they also said that the Otways would be nice. I had a very nice conversation with the father of the family as it just so happened to be a Triple J Radio listener. Wow, so it’s not just rebellious young teens or college students that listen to this stuff, I thought to myself. I guess I’m not insane after all. Of course, he wondered how I found out about it since we were not Australian. That was when when I told him how I discovered it on our last trip to Australia and how I listen to it over the internet at home. Once I got hooked on Triple J, there was no turning back. Everything else in America sucked compared to it. I also got a few chuckles from them about our kangaroo incident on the last trip. “You truly experienced the real Australia,” said the mother. Anyways, as the family decided to hike towards the bottom of the falls, Julie and I lingered behind. Then, we started to notice the sun starting to break through some of the cloud cover and the fog starting to roll its way up the cliffs. 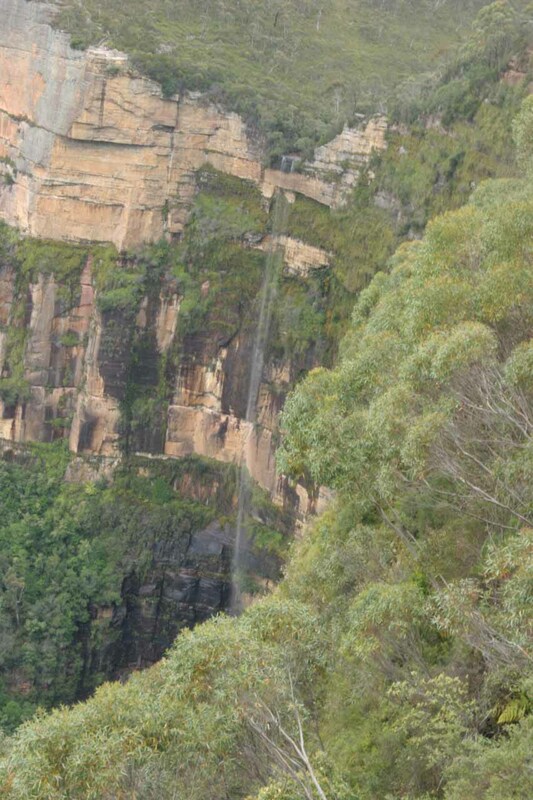 And within seconds, we could finally start to see the Katoomba Falls! Fortunately for the family, the mother stayed behind and quickly yelled to the rest of the family to come back quickly! After briefly looking at a mostly foggy Witches Leap near the overlook, we returned to the car and made it Echo Point at 11:24am. 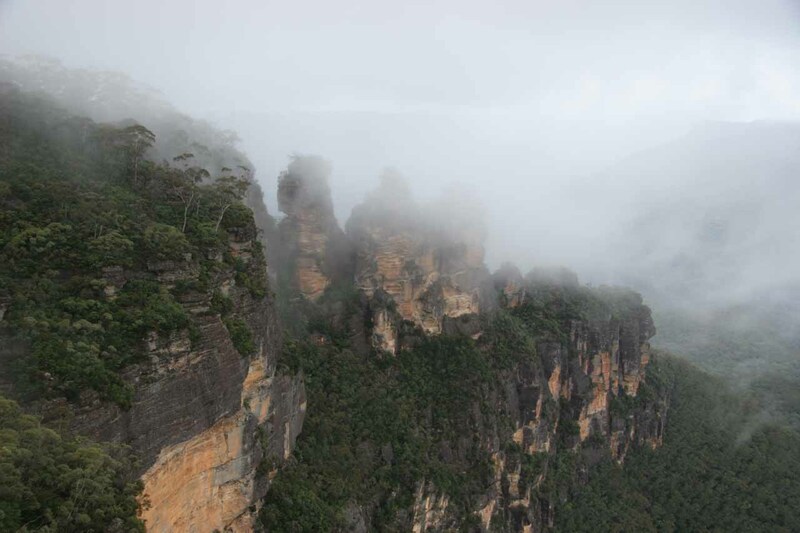 The scene here was considerably busier than yesterday arvo (short for afternoon), but clouds still shrouded the Three Sisters as well as most of the valley views. Julie and I decided we’ll be patient on this one and make sure we’ll see this iconic attraction. And after a few minutes of waiting, we experienced yet another moment of brilliance as the clouds lifted for just another fleeting moment before the Three Sisters were hidden by the clouds once again. At least we got to see the Three Sisters and take photos of it. 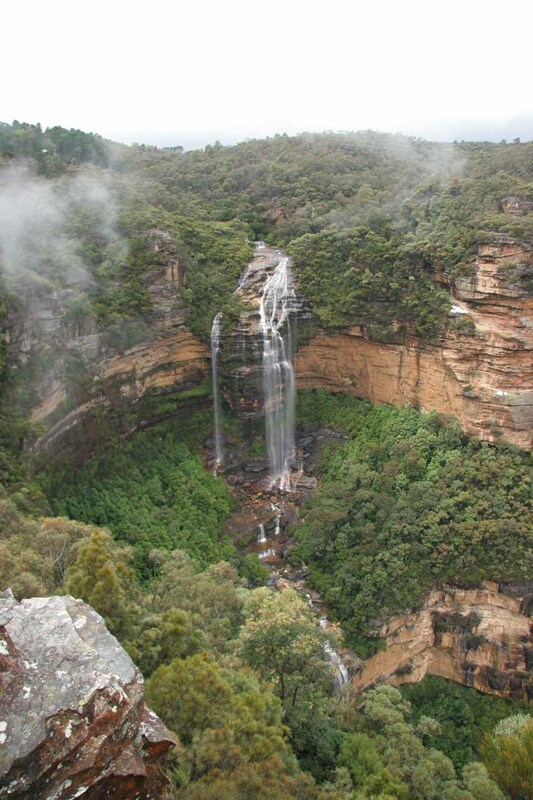 Now it was time to get back in the car and make our way over to Wentworth Falls – the next must-see attraction before we could head on over to Wollongong. It was 11:58am when we left Echo Point. 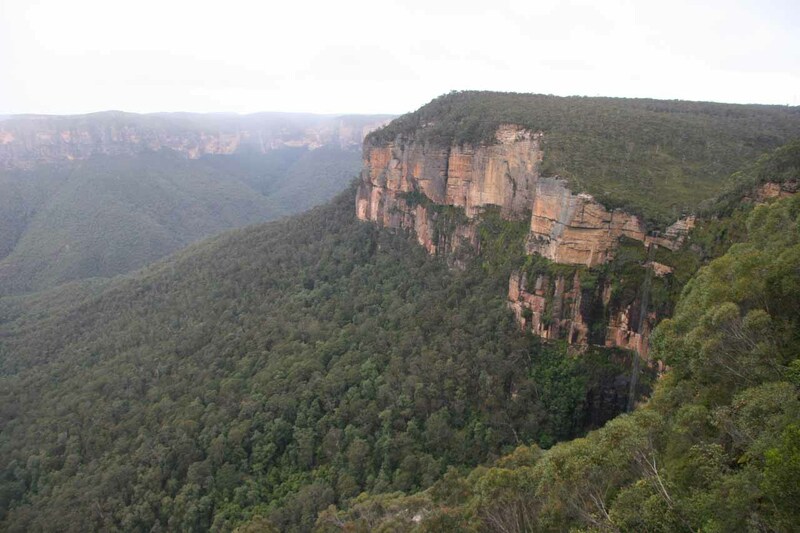 I decided to drive along the road following the cliffs towards Wentworth Falls. 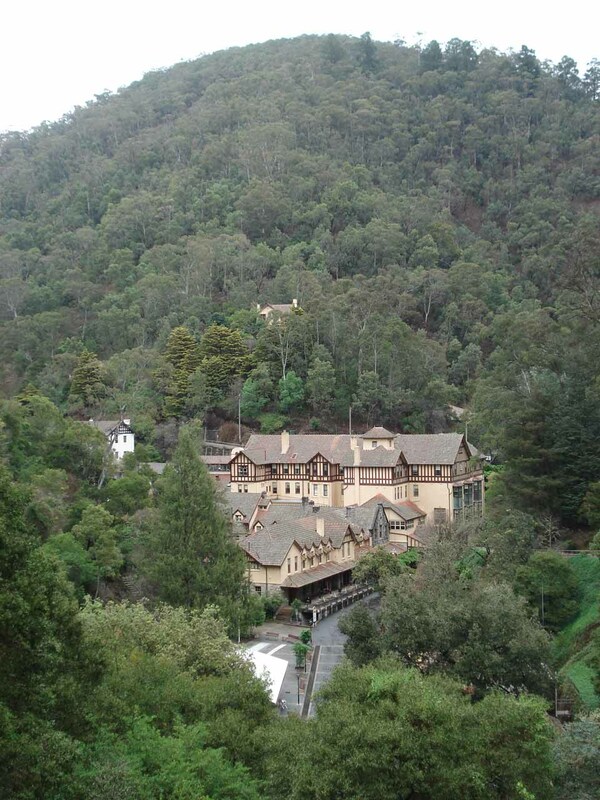 Along the way, we passed by the Leura Cascades (but didn’t stop for it) and made a brief stop at Gordon Falls. 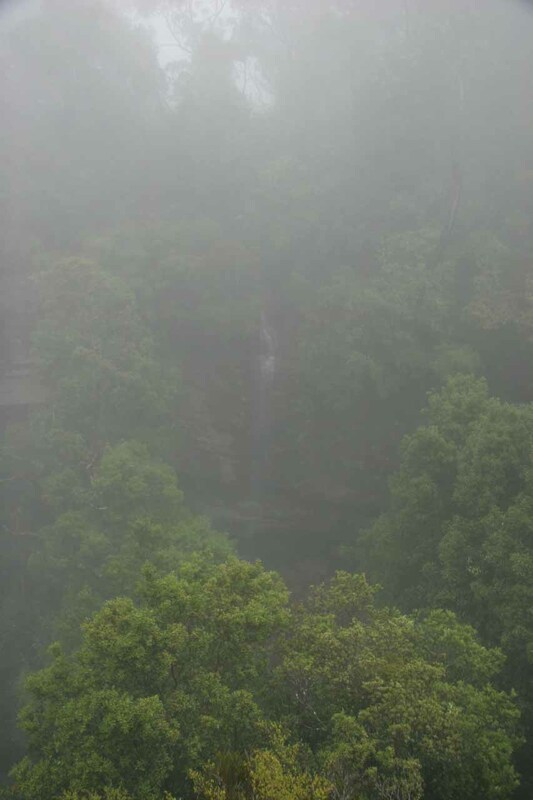 The Gordon Falls flowed well but it was foggy and the view from the puddly viewpoint was not very good. 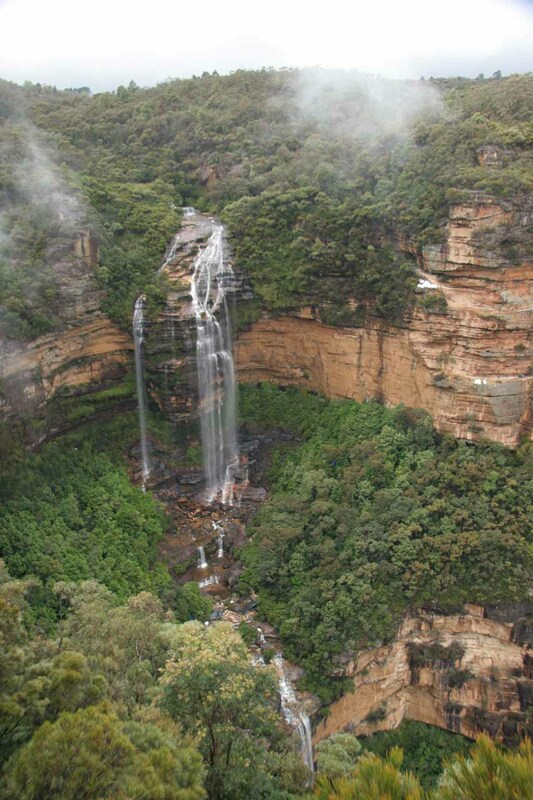 At 12:44pm, we finally arrived at the Wentworth Falls car park. 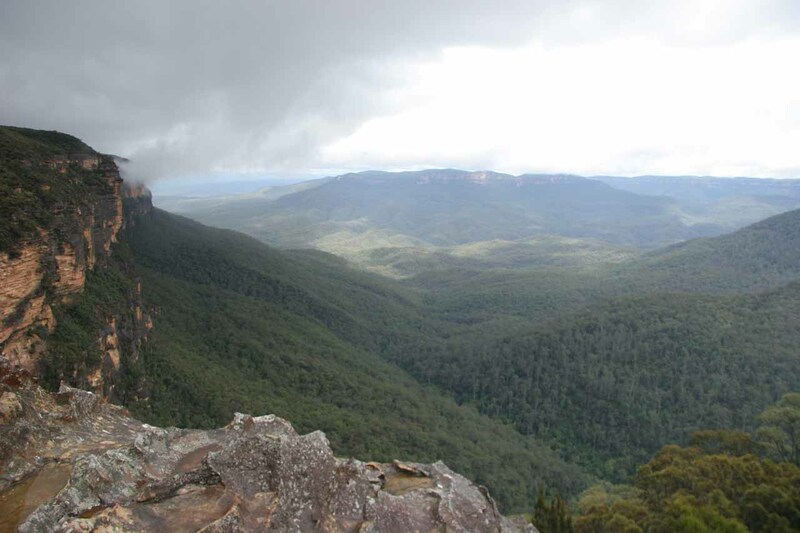 We took the brief walk down some steps and towards an overlook allowing us to see both Wentworth Falls as well as Princes Rock. 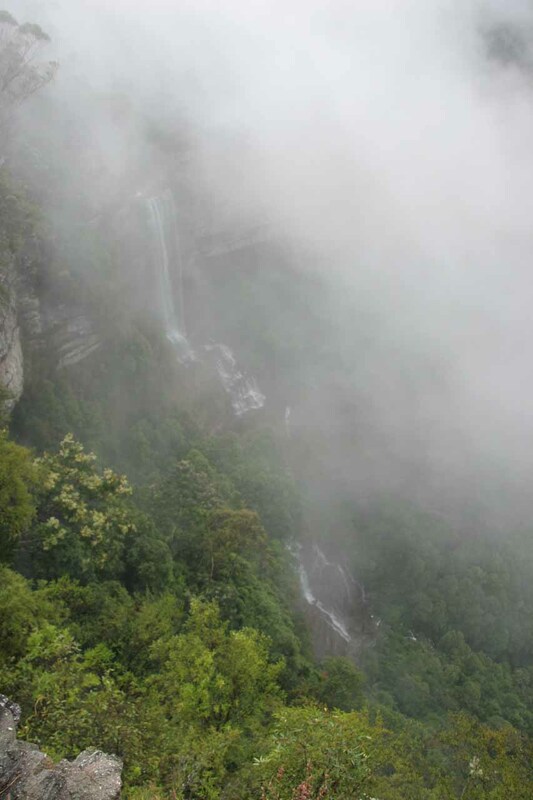 The couple we saw on their way back up told us to hurry before the clouds might start covering up the falls again. So in no time, Julie and I took plenty of photos of the impressive waterfall. There looked to be some closure relics (the track into the canyon was closed) near the base of the falls, but we weren’t about to do the walk anyways. 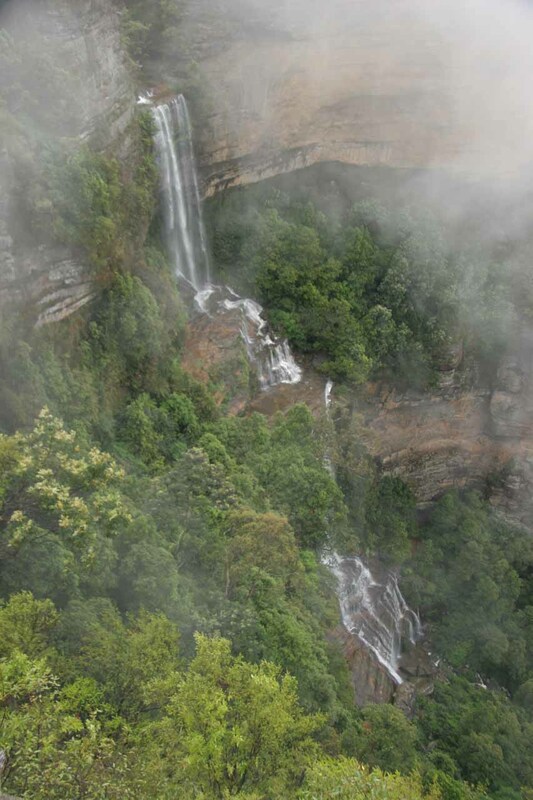 The direct view of the falls was quite impressive and probably surpassed the profile view of Katoomba Falls that we got earlier in the morning. 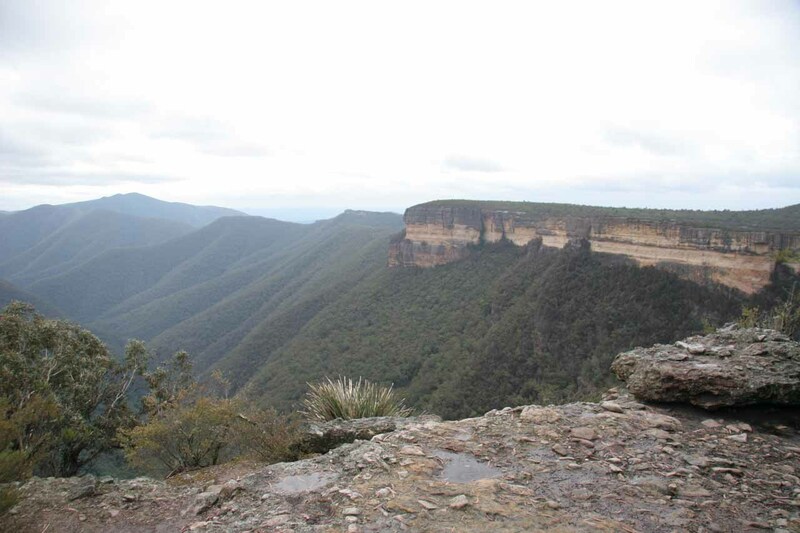 By 1:15pm, we returned to the car but not before checking out the so-called Wentworth Falls lookout, which didn’t even yield a view of the falls. And so even though our Blue Mountains experience was reduced to nothing but moments of brilliance, at least we got what we were after and now it was time to head on over to Wollongong. At 3:53pm, we arrived at the Downtown Motel in Wollongong and checked in. 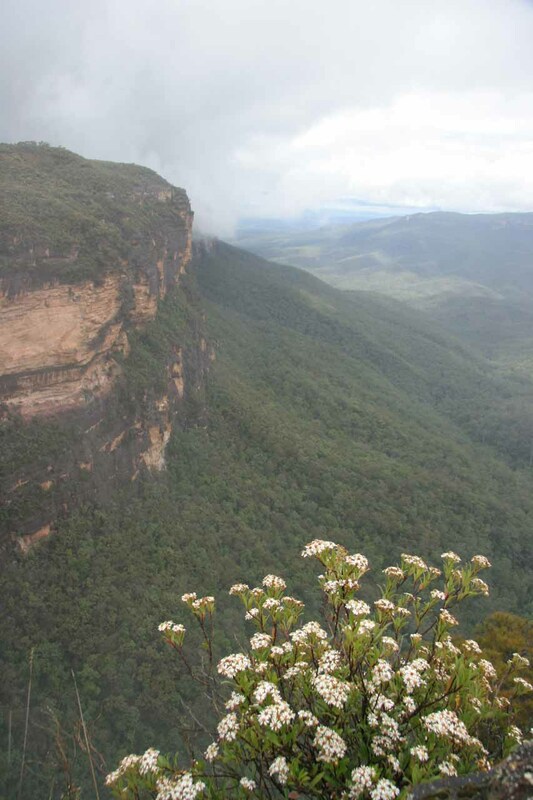 Down here, it seemed like the weather was significantly more improved that the Blue Mountains. Of course, this also made me wonder what Victoria would be like if it was already dry down here. 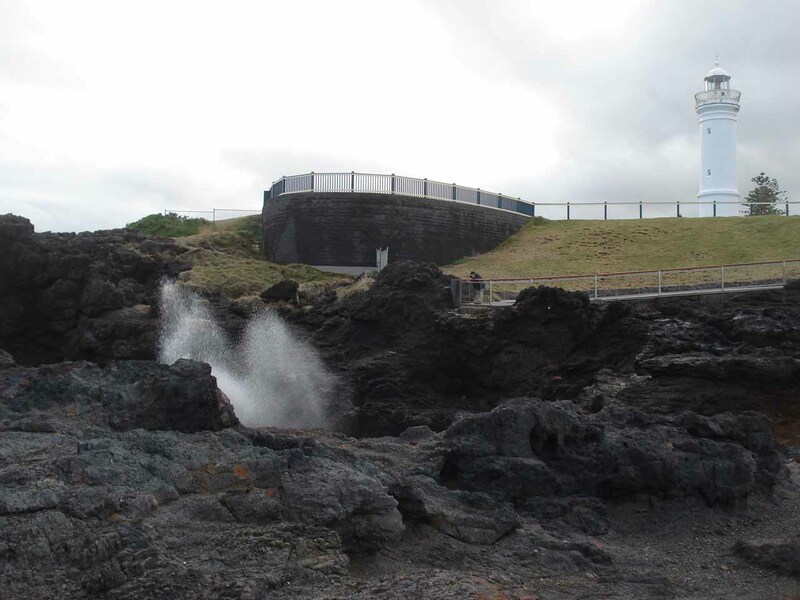 At 4:05pm, we decided to check out the Kiama (pronounced “KYE-am-uh”) blowhole, which we promptly did at 5:08pm (after the nearly hour long drive further south). 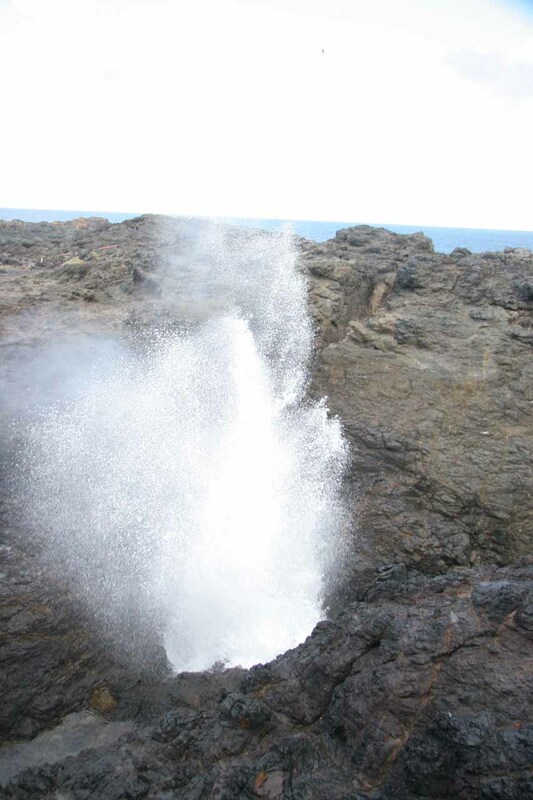 We spent a few minutes seeing the blowhole in action before the lighthouse. The scene here (rougher seas and coastlines) was quite a contrast compared to the mountains, fog, and waterfalls we saw earlier on this day. But by 6:12pm, we were back in Wollongong and had ourselves some Thai food at this place called Coconut Thai to satisfy Julie’s craving for it. Tomorrow was supposed to be a day to be seeing a bunch of waterfalls. I sure hoped they’ll be flowing somewhat close to normal considering the amount of rain we had been seeing up to this point. But with this thought, we went to sleep after watching some Australian news with a keen eye on the weather.